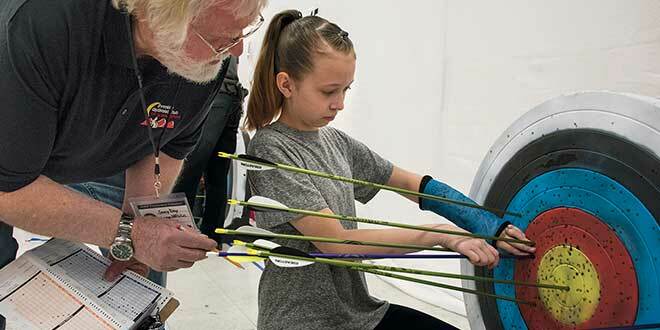 A record number of young archers from across New Mexico competed in the 2018 National Archery in Schools Program (NASP) New Mexico State Tournament. 906 archers competed surpassing last year’s record attendance number of 840. More than 100 public schools across New Mexico participate in the program that fits youth no matter their popularity, athletic skill, gender, size or academic ability. The department will provide educator training, hosts the state tournament in 2019 and access to archery equipment through the “Archery Loaner Program” including 10 right and 2 left handed Genesis bows, two boxes of arrows, five targets, an arrow curtain, a repair kit and a bow rack. 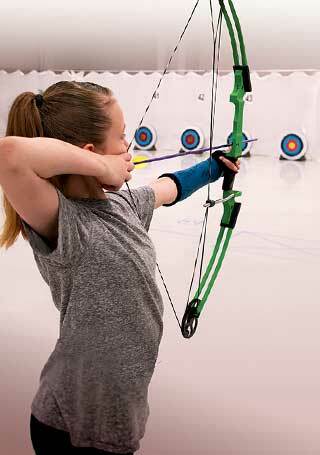 For more information about the National Archery in the Schools Program and how your school can get involved, contact John Martsh, R-3 program manager at (505) 222-4719 or d.martsh@state.nm.us. Top: Cipriana Sanchez takes careful aim at her target at the 2018 NASP State Championships. Cipriana competed with the team from Milan Elementary. Bottom: Cipriana and a NASP volunteer remove arrows from a target. Department photos by Martin Perea.